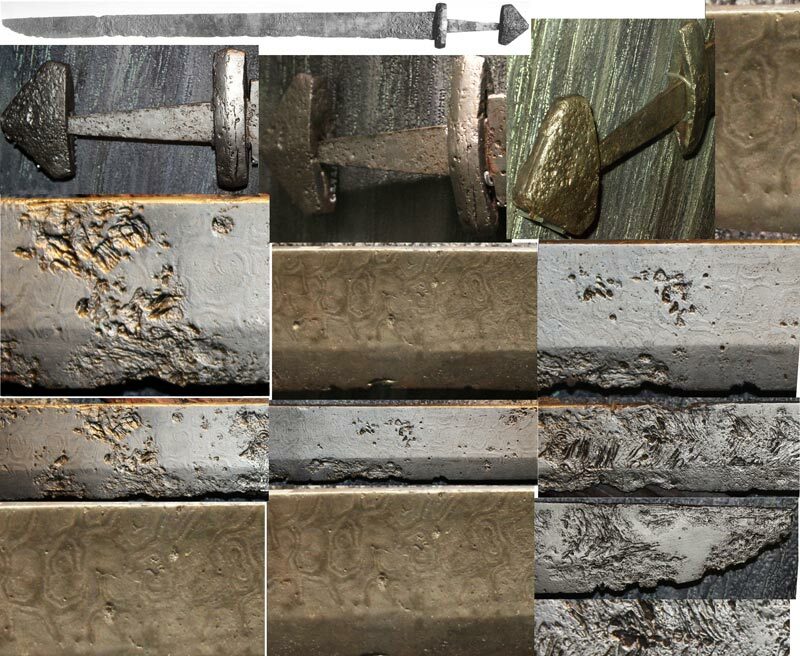 I have been intrigued by the single edged Viking sword found on the Arhus Farm in Norway since I saw pictures of it in Ian Pierce’s “Swords of the Viking Age.” It may be the only single edge Viking sword ever found with a pattern welded blade. 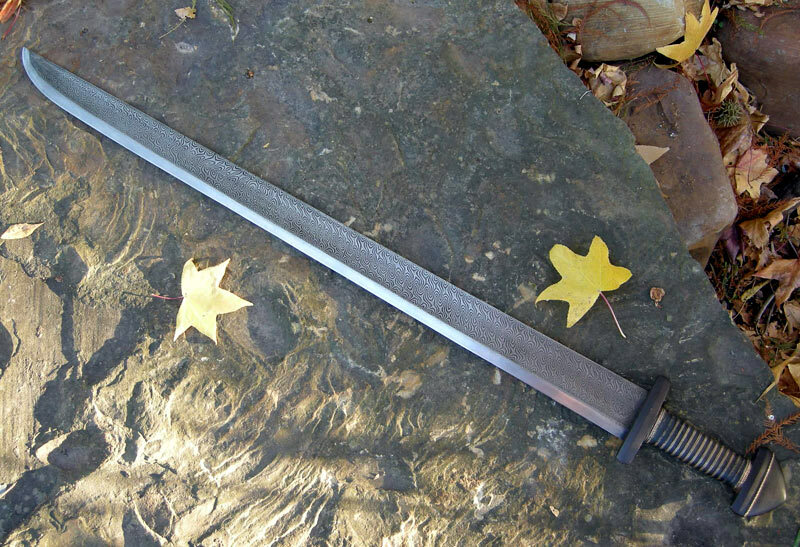 About six years ago I convinced Vladimir Cervenka into building a replica of this sword for me. This sword was not meant to be an exact replica of the Arhus Farm find. There are some differences, such as an H pommel instead of the C pommel on the original. 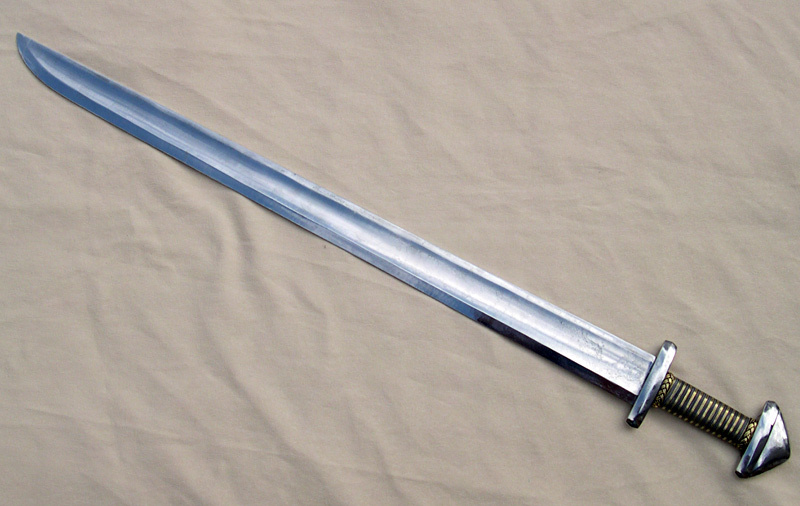 If you have not seen this Cervenka sword, I have reviewed it here. Since the review, I have been doing some changes. 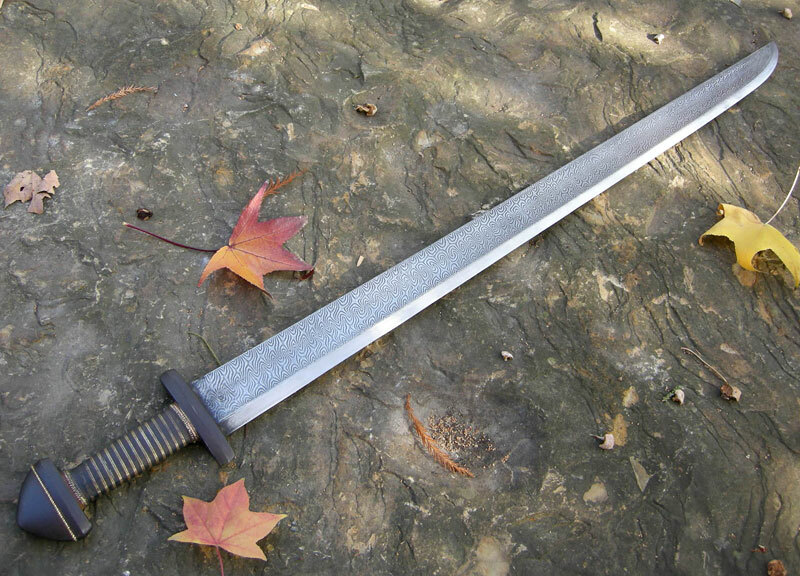 I reshaped the upper and lower guard and pommel… mainly making the width of the pommel smaller. 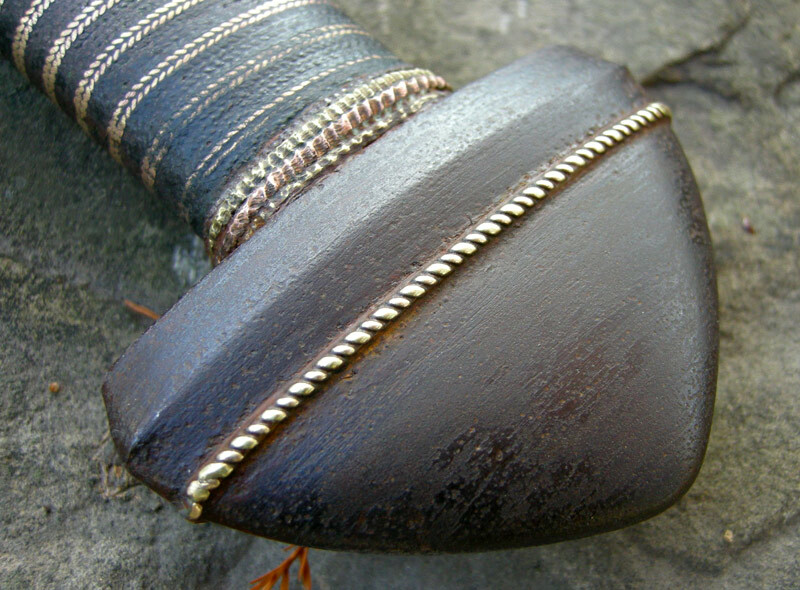 I also cut in twisted copper wire between the pommel and upper guard. 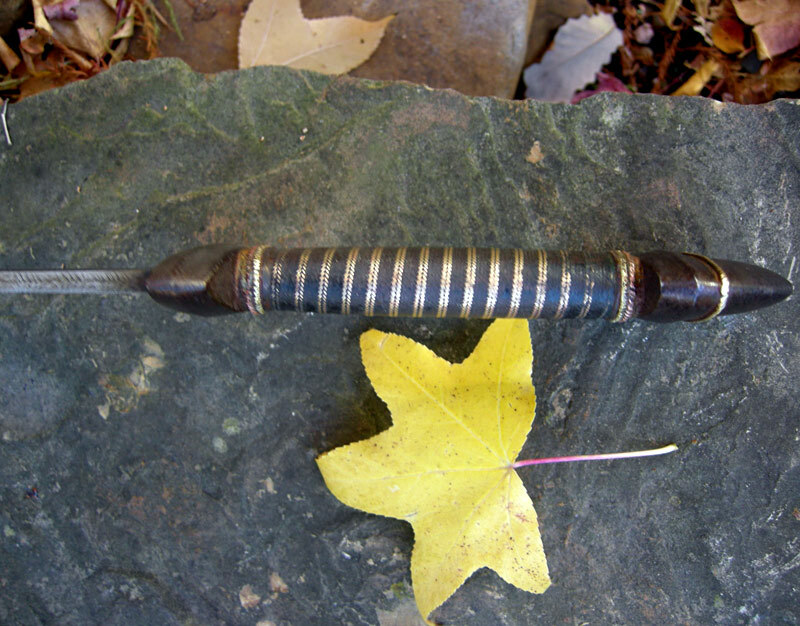 Then I browned the hilt components with cold browning solution and polished with steel wool. The Turkish Knot ferrules were replaced with copper and bronze wire shaped with my Dremel tool to look like an engraved metal plate ferrule. The twisted wire grip was also sanded down and blued to make it appear it had been well worn over the years. 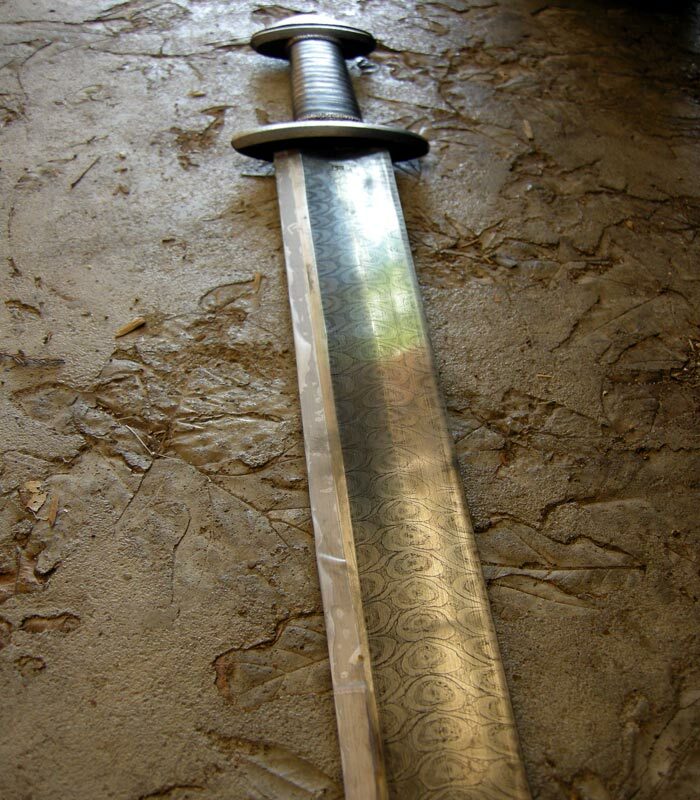 This is the look I try to achieve… the look of an heirloom weapon that has been through at least one lifetime of burnishing in use and periodic care. 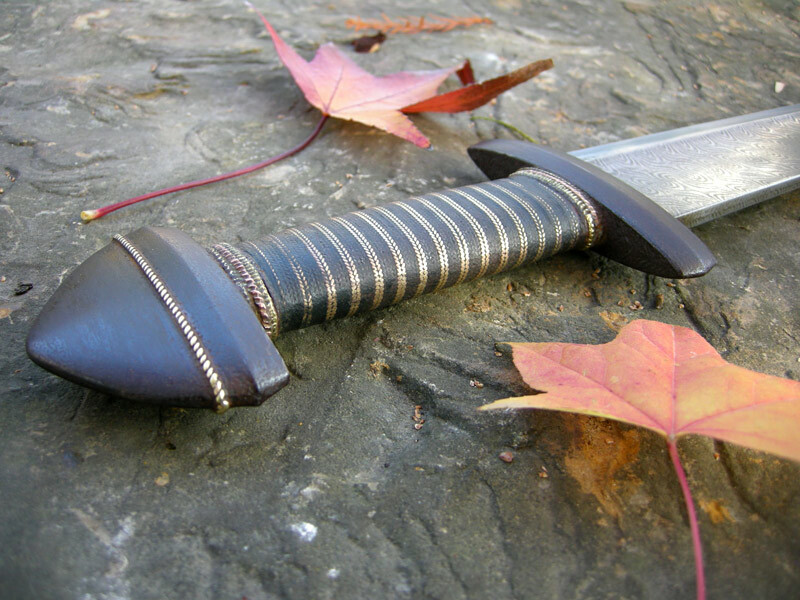 For instance on the hilt I have identified pressure points when the sword is griped or as the hand would naturally lay upon the hilt as it hangs at its owners side. In these areas, I have done a little extra grinding and polishing. I kept the blade profile shape much the same. However, I did file down the spine a bit from the COP to the tip to give a slight drop to the point seen on many of the single edged Viking originals such as the Arhus Farm find. 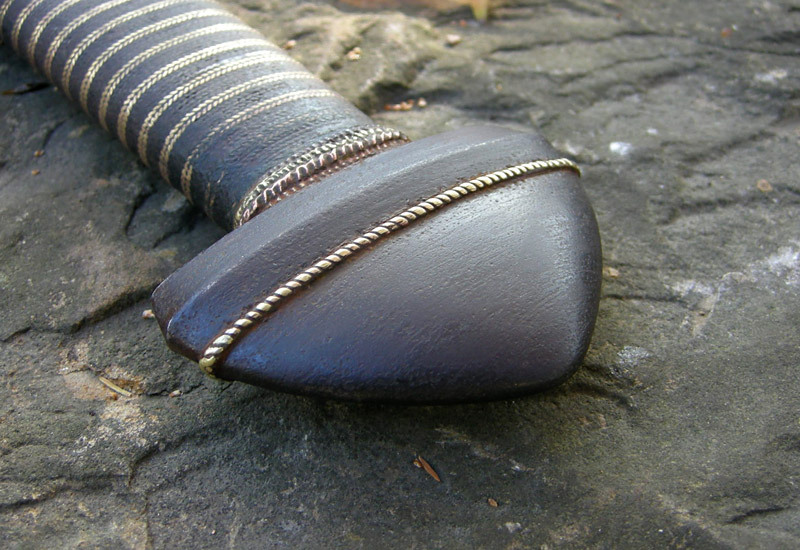 Most of the reshaping of the blade occurred in the fuller. I did a good bit of grinding in the top of the fuller to take it right up to the spine. 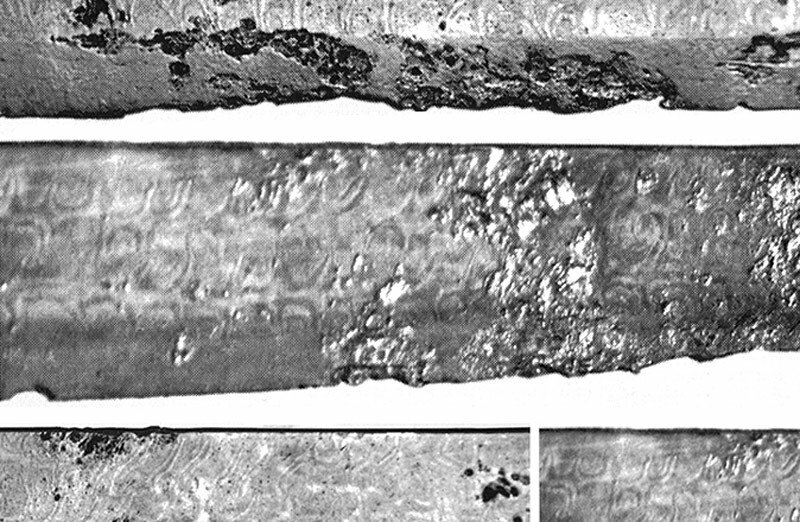 Once the fullers were shaped, I began to experiment with ways of duplicating the surface phenomena (topography and the slight discolorations) of pattern welding. 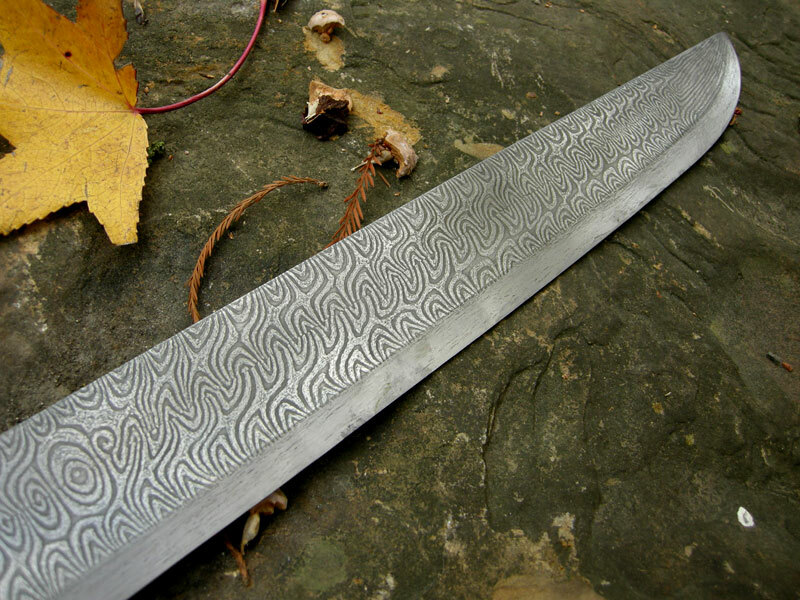 When I started the process, I was not trying to replicate the patterns of the Arhus Farm pattern welding. I wanted to do a chevron like pattern instead. My first attempts were with small pools of warm vinegar trying to generate the pattern in the deep etched lines along the outer edge of the vinegar. However it was too fluid for very good control. 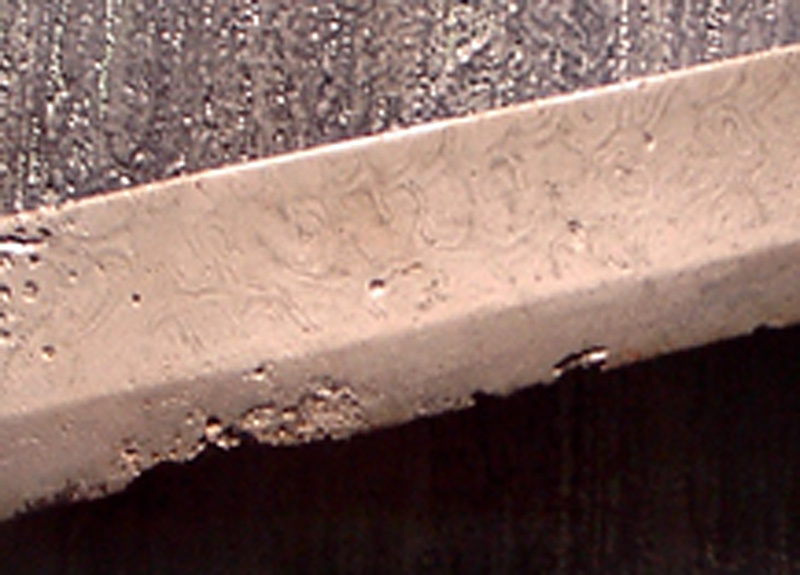 It created and interesting patterns, but not anything like the look of true pattern welding. Also I didn’t like the look of a chevron pattern on a single edged blade. So I sanded it all off. On my next attempt I used mustard. It etched like vinegar but was thick and sticky enough to draw or blot patterns with it. I started with the innermost circle of the concentric circles, layering each drop of mustard, allowing each drop to cut along the edges before the next drop of mustard was placed over it to cut the next concentric circle. If the mustard was warm, it cut even better, especially along the edges. 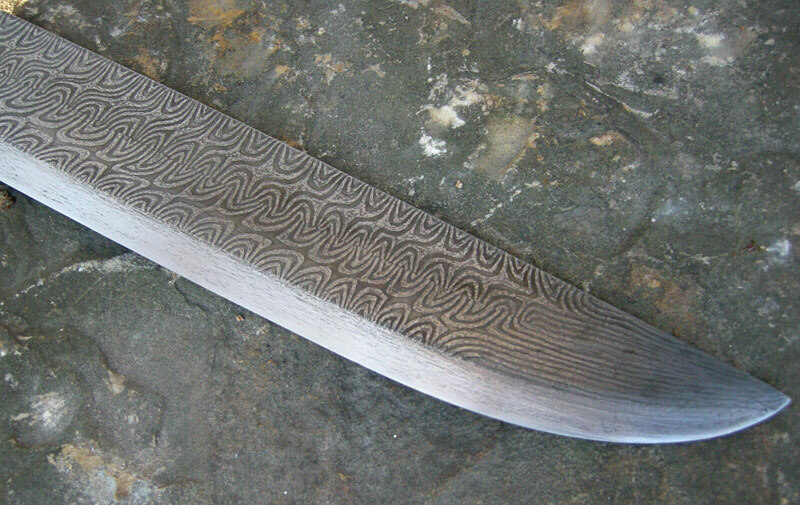 So I put warm mustard on the blade in concentric rings to try and duplicate a pattern similar to torsion pattern welding. This time the pattern was not chevron (imitating billets twisted in opposite directions). This time I moved a little closer to the Arhus Farm find in that the twist patterns on both “billets” were in the same direction. The look of the etch was a little more convincing, but was still not satisfactory to me. Plus warm mustard made the house smell really strange. So… I sanded it all down. At this point I moved out of the “kitchen” and made my way to Radio Shack to get some ferric chloride. First I put down a resist (barrier to the etchant) of permanent ink drawn on the blade with an ultra thin point Sharpie. As before, I was not trying to duplicate the Arhus Farm find pattern, but drew a very regular pattern similar to billets twisted in the same direction and laid side by side. I taped off the areas I was not etching with scotch tape and worked on each side of the fuller… each “billet,” …one at a time. With the Sharpie resist, I had much more control over the details of the pattern. It looked much more like true pattern welding, and had the topography and discoloration I wanted. So I took the time to do both sides of the blade. At this point I thought I was finally finished. I was happy with the technique, but the pattern was just too darn even. It just didn’t have the organic look of the Arhus Farm find. It was about this time that I found another picture of the Arhus Farm find. 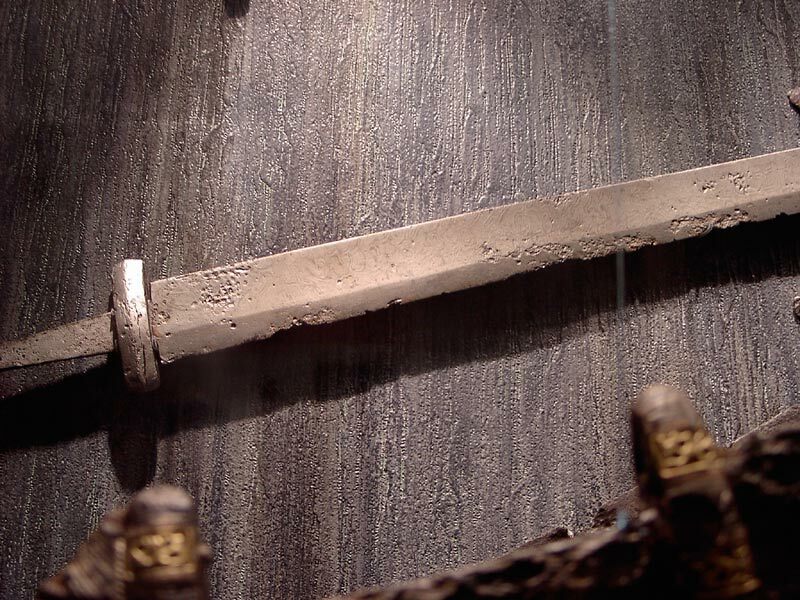 I was able to enlarge the image to begin to get a better idea of what (I thought) was the other side of the blade from that shown in “Swords of the Viking Age,” by Ian Pierce. Since then I am convinced that one of the pictures of the pattern welding in Pierce’s book has been reversed. But at the time, I thought I had images of portions of both sides. It was either this discovery or my growing dissatisfaction (or both together), that led me to take up the coarse sandpaper and, once again, sand away all my work. Both fullers were sanded smooth. With the better images of the details of the Arhus Farm find’s pattern welding, I decided to try and duplicate the actual pattern of the original (or at least the parts exposed). I have posted some compiled images of closer views of the patterns in the Arhus Farm find. I started near the forte and, as I looked closely at the images and try to draw the patterns, I began to notice how irregular the width of the billets and what I interpreted as the twist pattern reversing every few inches, especially in the billet closest to the edge. As I began to draw these patterns it looked a little too organic. 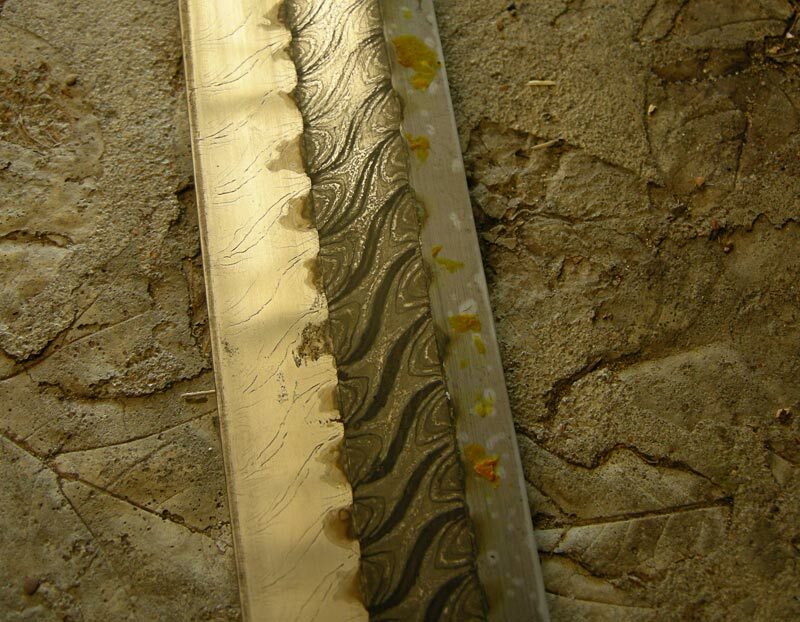 It does not show up that clearly in pictures of the corroded blade at a distance but on a clean blade these features looked a little too obvious to my eye. So I sat the sword aside for awhile until I was more certain about the pattern. I wanted "organic," but not too organic. Not too even. Maybe something with a theme. And the strait untwisted layers at the very tip-end could be a tongue or fire coming out of the mouth. To top it all off, up the blade on the Arhus Farm find, there is a section where two of the large “blood eddy” like circles come together on either side of the two billets and looks like a big eye. So once again, I began inking the fullers with surface patterns similar to the Arhus Farm find... This time with the theme of producing a “Fire Worm.” I felt this was appropriate considering that hidden zoomorphic forms are a long standing tradition in the European Iron Age art design. This time I wanted an organic look but not too organic. I wanted patterns similar to the Arhus Farm find but a little more regular, but not too regular. In the first few attempts at etching, I tried to etch each “billet” separately using scotch tape to isolate each “billet” form. The problem was that the edge of the scotch tape was too straight. It also produced a deep etched line along the boundary. It did appear to be a weld line, but when the billet on the other side of the fuller was etched this line got larger and deeper. In the latter attempts to try and deepen the topography of the etch, I produced the patterns over the whole fuller and etched it all at once. With this the line between the billet was not as pronounced. Also etching the whole fuller at one time seemed to produce a deeper etch, maybe because of the large amount of etchant used to fill the duct tape reservoir I created around the blade. 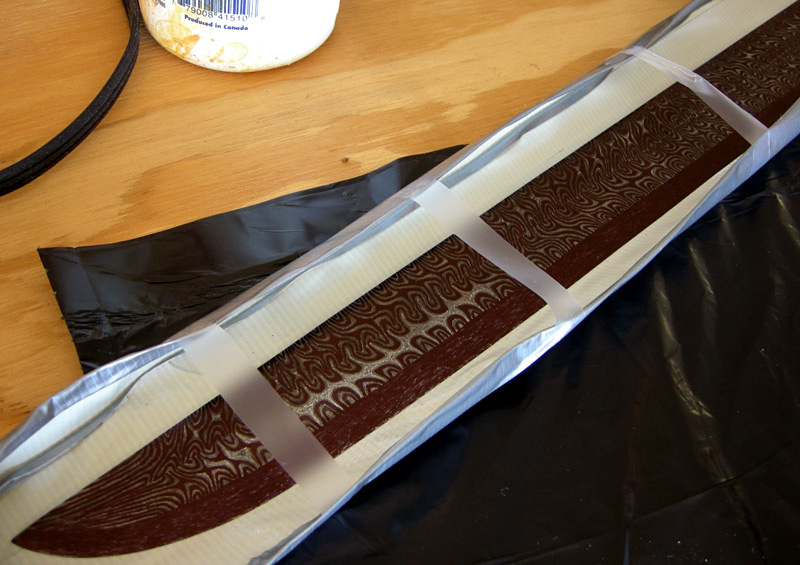 I made a reservoir out of duct tape around the blade and filled it with warm ferric chloride. After about 15 minutes I took the blade out and washed it with Windex. Then I sanded the high parts of the etching very lightly with dulled extra fine emery cloth. 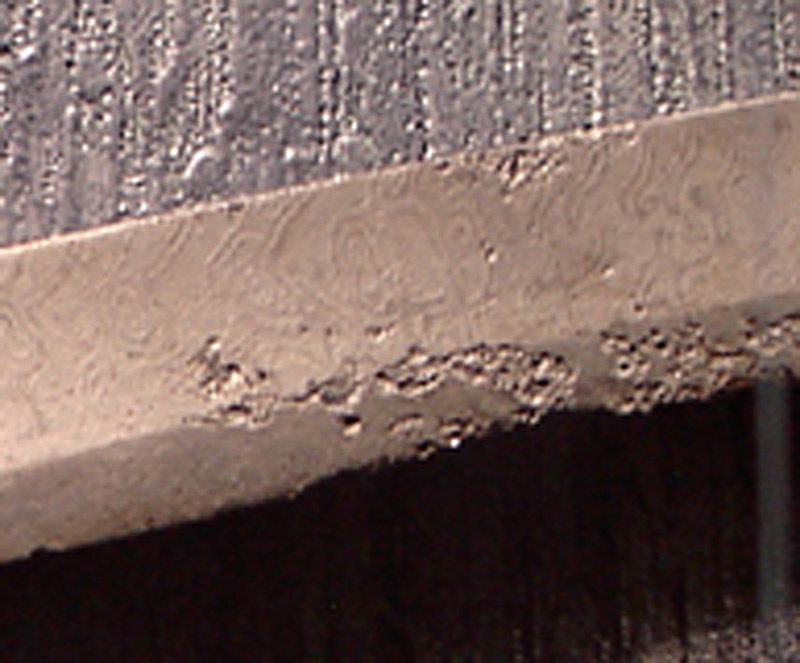 Close-up of tip with "teeth" in the duct tape reservoir. Blade center in duct tape reservoir. 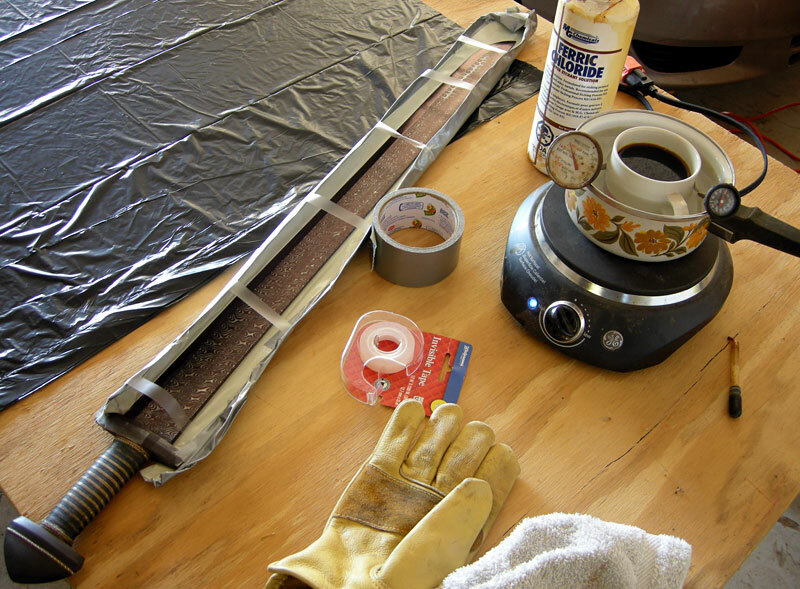 Duct tape reservoir and set up for warming the ferric choride. Reservoir filled with ferric chloride. Allowed to set for 15 minutes. 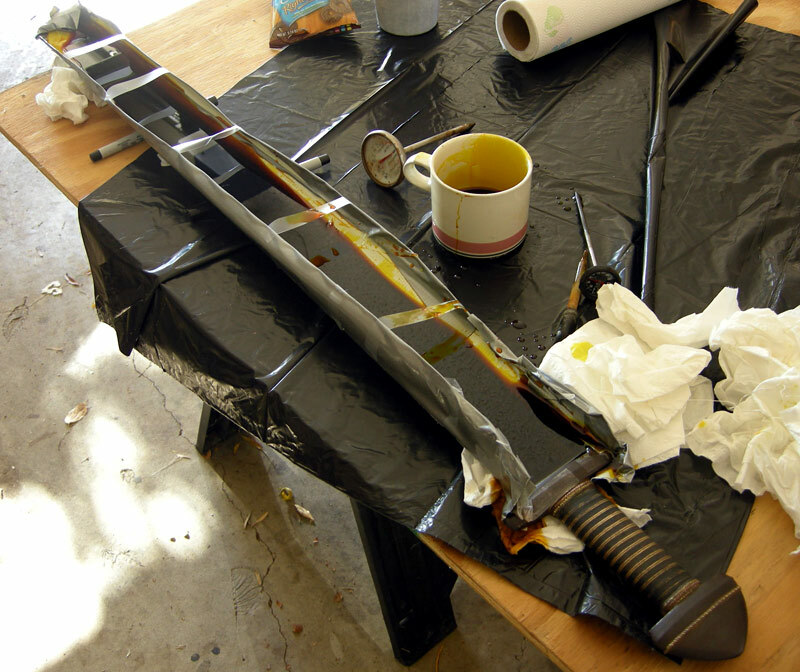 Blade after taken out of ferric chloride and sprayed with windex... before cleaning. 1. One layer of Sharpie ink is not enough. The etchant eats through the ink too quickly. So apply two or three layers of Sharpie ink. This means drawing the pattern and then going over it again. 2. 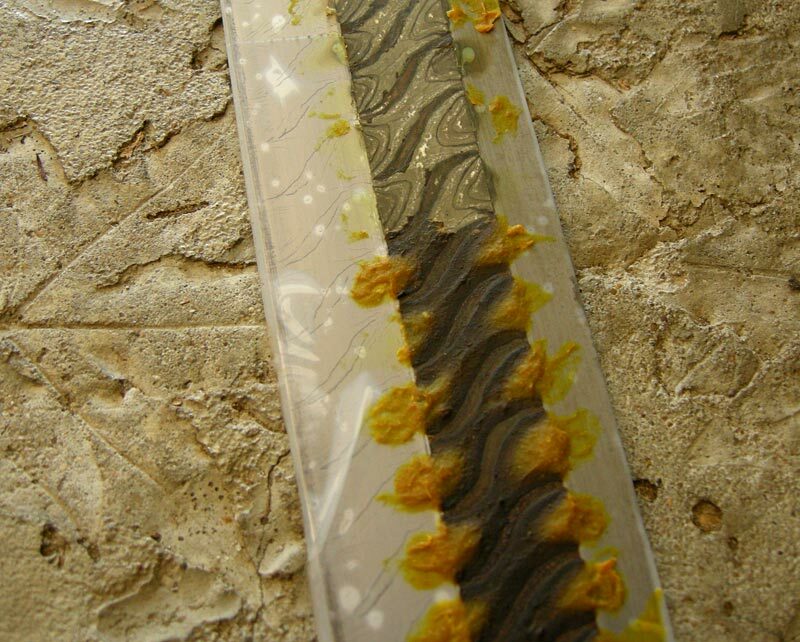 Use a toothpick to clean up the edges of the pattern, especially in areas of very fine lines. Move the tooth pick in your fingers to find where the wood grain will cut away the ink best. 3. Etchant cuts better when warm 110 to 140 degrees. 4. Less than five minutes in the etchant does not cut very deep more than 15 minutes and the sharpie ink begins to wear away. 5. 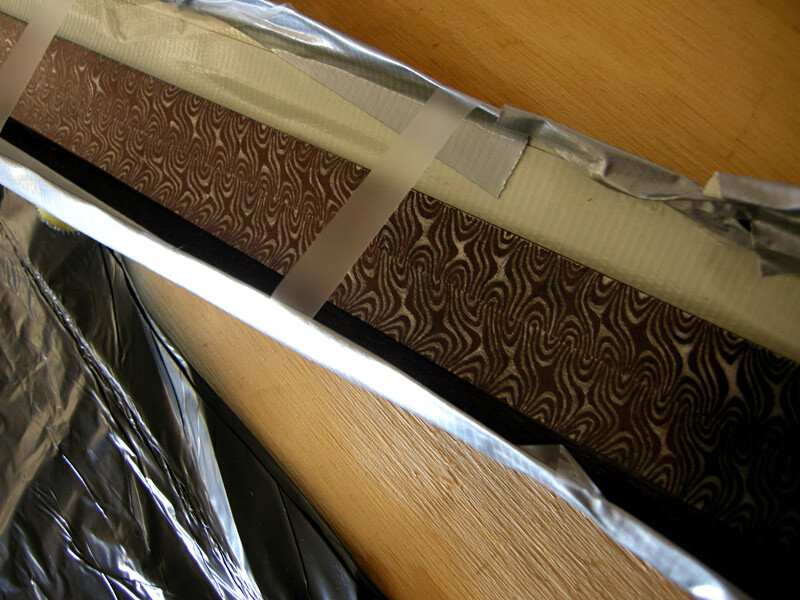 Make sure the blade is polished very smoothly before you begin drawing the pattern, because any scratch will grow deeper and more obvious with the etching. 6. When drawing patterns, don’t make everything too even. One of the nice things about this technique is that you can make any pattern you want. 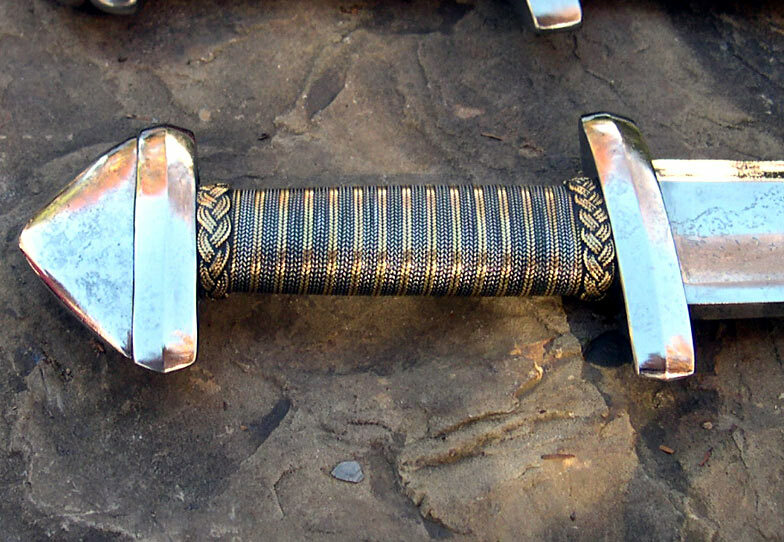 You could even recreate very specific original pattern welded patterns if you had pictures of them. 7. Make the “weld” line between billets a little wavy and not perfectly straight. 8. Don’t make the edge of the pattern welding follow the fuller edge perfectly but let it wander in and out of the fuller a little in places. 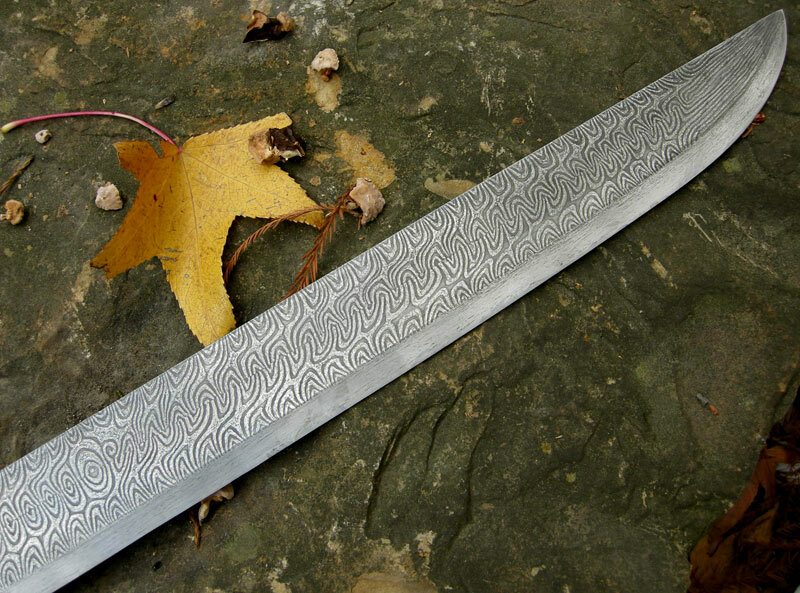 Now a few more pictures of the finished blade. It looks like it must have taken you a huge amount of time! But the result is beautiful! Congratulations! Fantastic, great work Kirk! Nice job sticking with it until you got the result you wanted. I'm sure it was frustrating having to re-do things that many times, but I think the result was worth it. 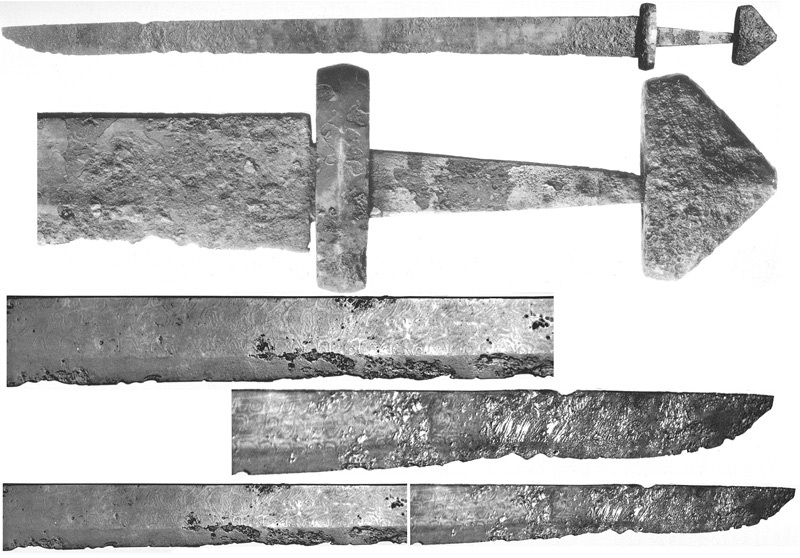 The Vladimir Cervenka blade was not pattern welded? Didn't find it stated in review & I can't get review enlargements to work. Just trying to clarify - you created the entire pw effect on a monosteel blade? I think I understand you do one side at a time. How do you protect the other side (especially if its done)? 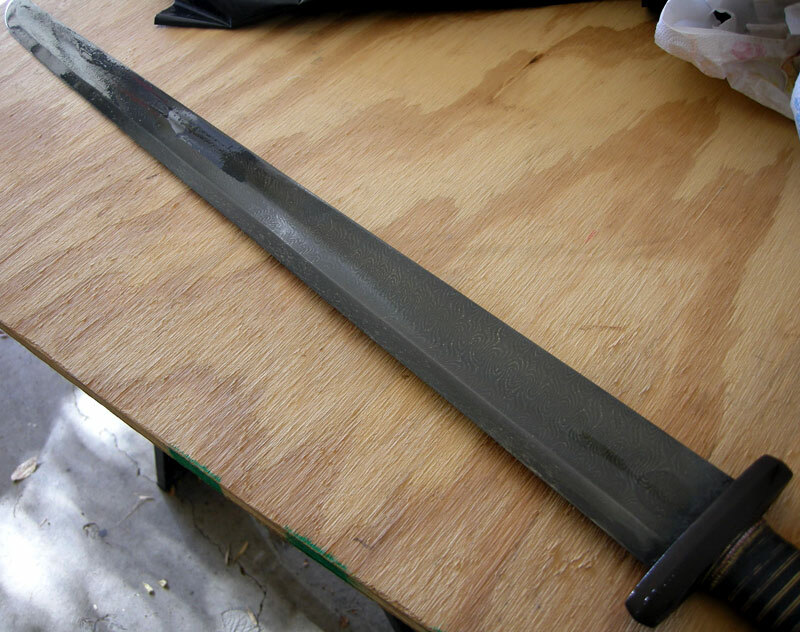 When you're done with this (or your "pw gladius") do you ever cut with? How does/would your deep etching hold up to cutting & cleaning up? Gutsy making big changes to such a nice sword. Well done! Thanks again. Yeah... took alot of time, but, for me, it is relaxing after a day of having to do so many different things at a time to come home and just focus on doing one thing.... very therapeutic. Impressive and very attractive work and the results look very very real: Which I guess is the point or it wouldn't be worth doing. I tend to like using lemon juice but I also like mustard as it's more controllable and doesn't flow randomly as much. Your project are always fascinating to follow. 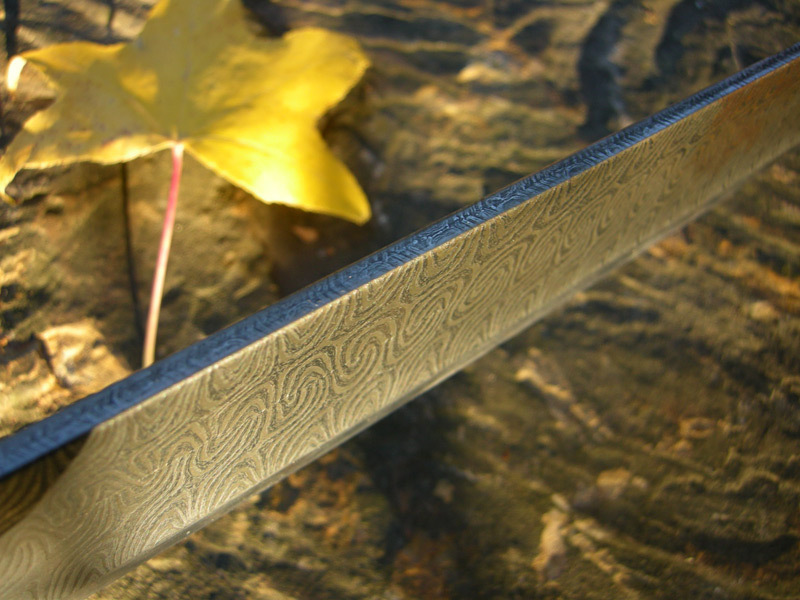 The major goal of the project was to find a way to produce a pattern-weld surface effect on a mono-steel blade. Vlad's blade was not pattern welded. He can do pattern welding, but I'm not sure if he has worked up to sword size blades yet. 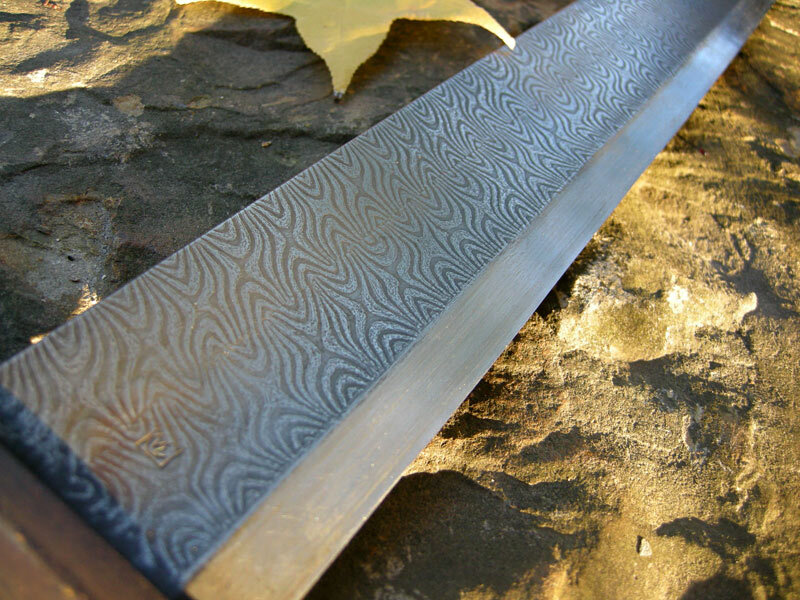 Vlad did age the blade with an acid treatment that gave some character to the surface of the steel. When I used the scotch tape, it put down a very straight weld line that remained through the whole project. In the second etch, I did not use the scotch tape but inked over the design on the whole fuller at once. On the edge "billet" I just covered the whole edge with ink. You can see all of this on the images I posted before the etch. 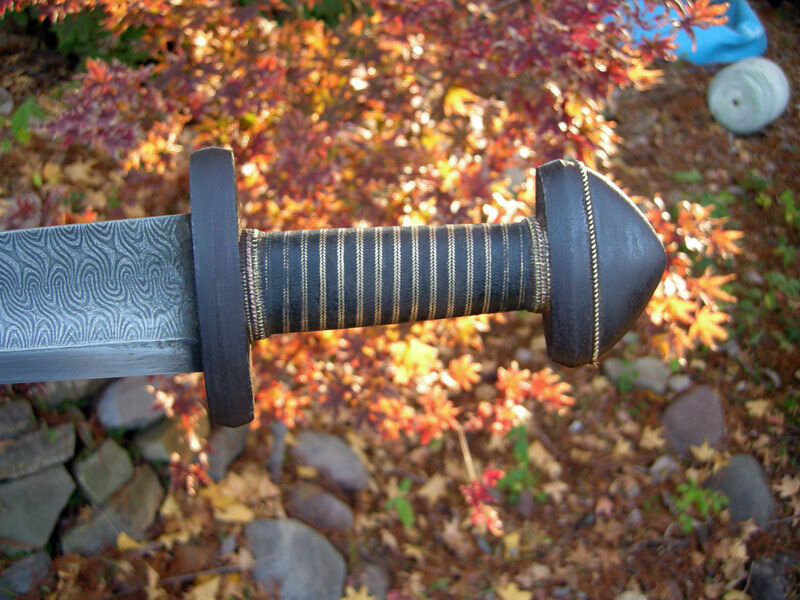 Here is the link to a Gladius I did during this whole process. It gives more info and shows how I etched one side at a time with the scotch tape. On the next blade I will not use scotch tape at all. 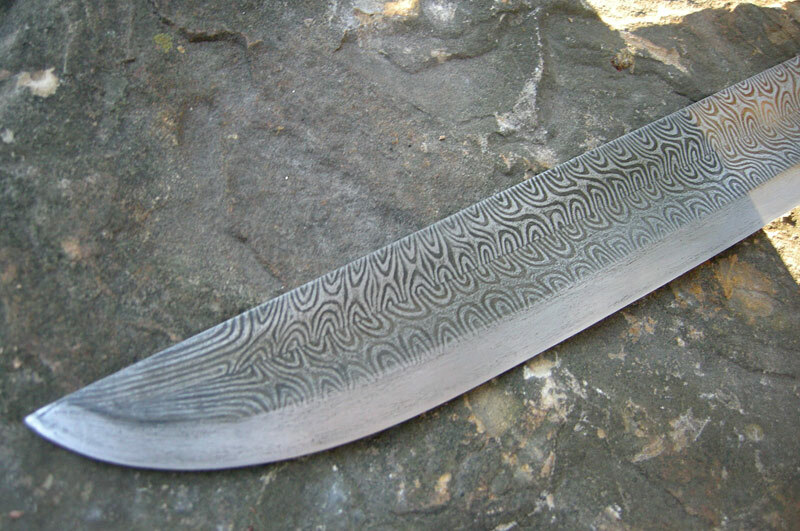 I will probably just use the ultra-fine Sharpie and draw the "weld" line very faintly down the blade making it a little wavy and then draw the patterns to this line. Once I have finished inking the blade, just before the etch, I will take the toothpick and clear any places where the line showed where the un-inked "eddies" matched across the "weld" line. 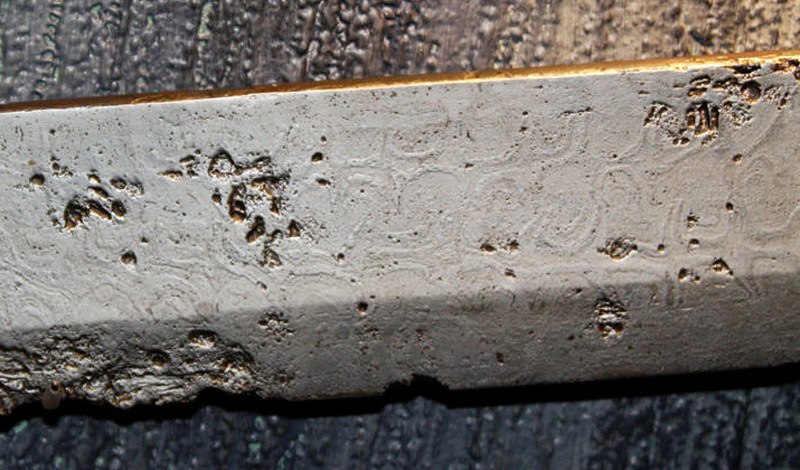 This is to be sure that it did not show as a raised area (rather than a etched line) after the etch. (not sure if that is clear) I just don't want the weld line to show as clearly as it does in the current project. I have not cut with the Gladius as it it some kind of zinc alloy and it is not sharp because I use it as part of my teaching collection. Now, the Cervenka Viking sword is very very sharp... dangerously sharp. 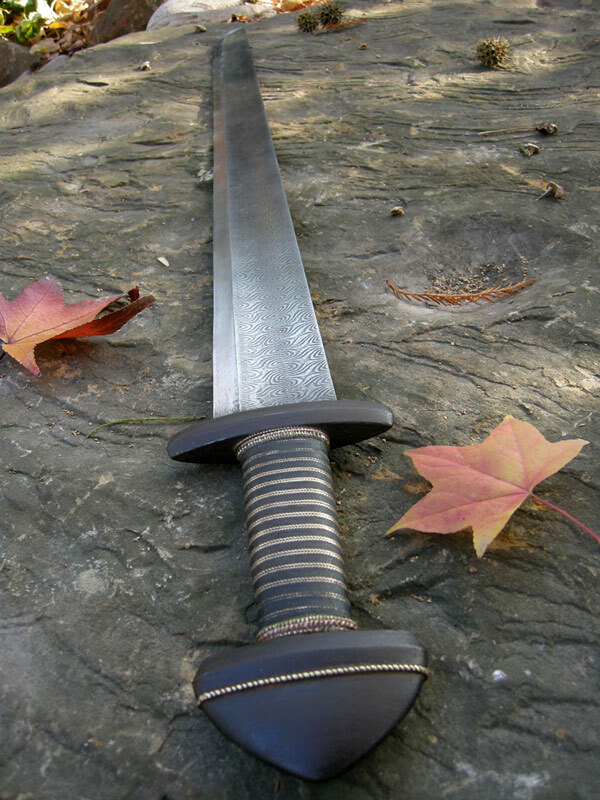 There is just something about the brutal nature of this sword's design and the way the blade just pulls forward when you hold it... I "wants" to cut. As a matter of fact, I was out in the back yard taking pictures for this thread and noticed an offending branch hanging a little to low... I could hear the sword wispering to me... It just had to be cut. I started with tip cuts and gradually worked down the blade closer to the forte. You could really feel the difference as you reached the middle of the blade. The extra mass behind the edge really began to bite deepter into the wood. 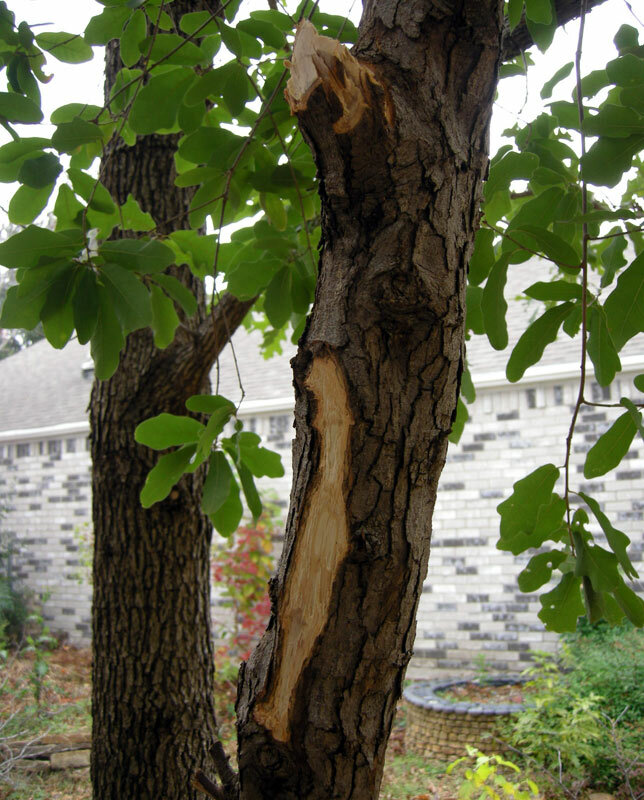 In one quick action it went though the branch, like it was warm butter and sliced a big chunk of bark off the side of the tree. hope this all makes sense... if not, let me know and I will give it another try. Vlad's blade was not pattern welded. 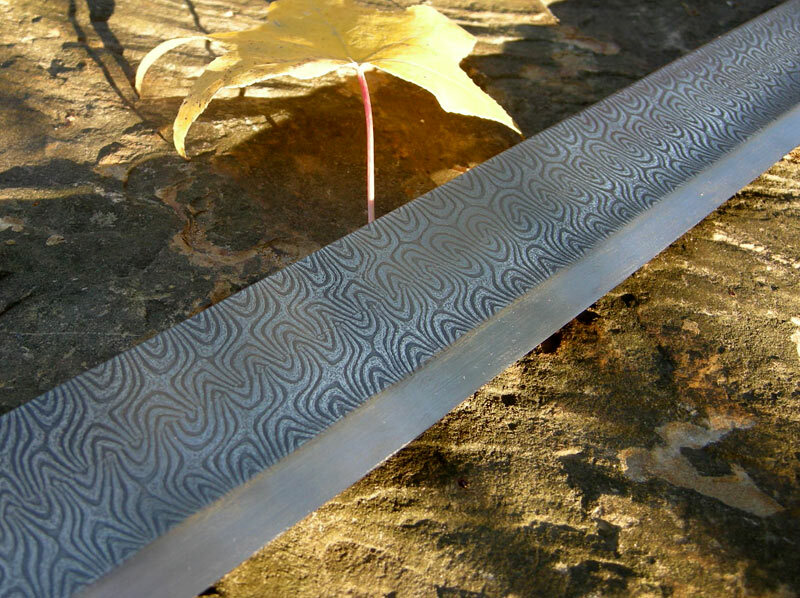 That is one of the better "pattern welded" patterns I've seen. 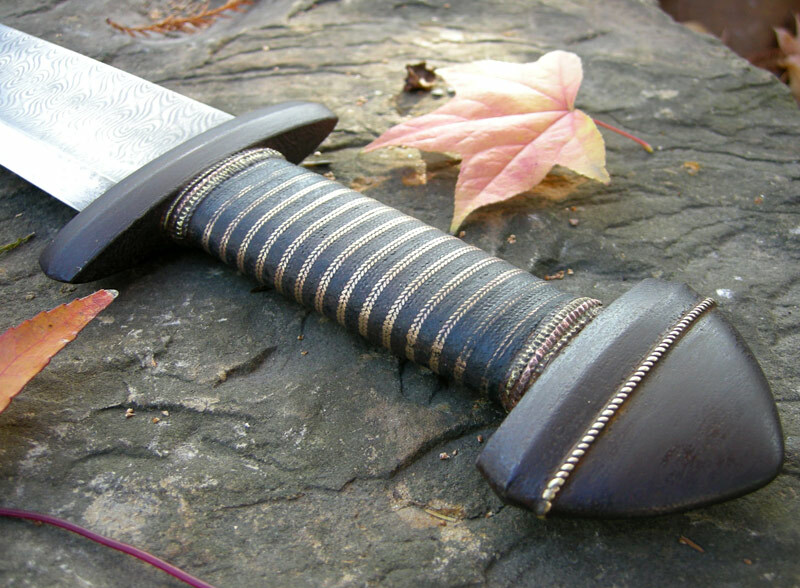 I got about half way through your posts just looking at the pictures before it dawned on me that this was a mono-steel blade. i guess maybe I should have been focusing more on the words rather than the pretty pictures I had no idea this was possible on a mono-steel blade. Outstanding work. 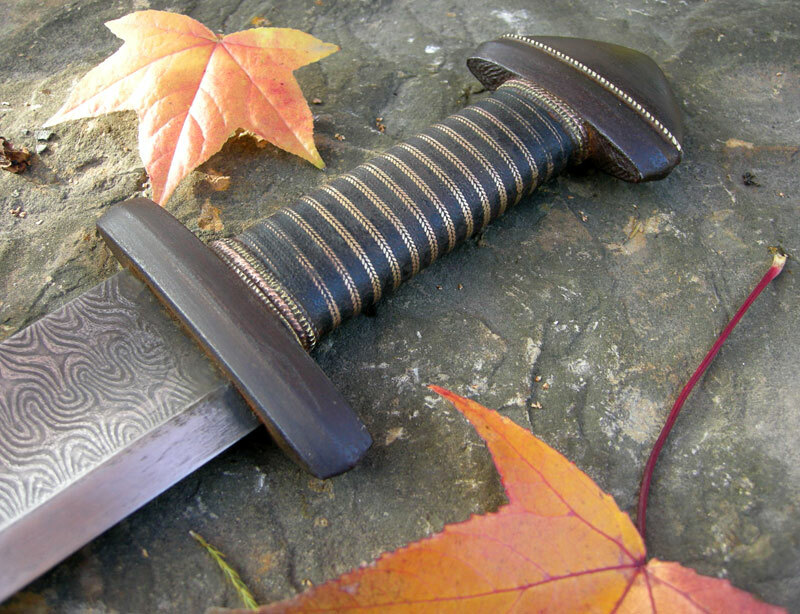 If I ever get brave enough I may have to try this on some of my swords. and he who stands and sheds blood with us, shall be as a brother. This was original ment to be for a later update of Vikverirs museum gallery, and I am sorry that I did not post it earlier. I gues the sword ha been cleaned by the musem since it does not have any rust on it.